When overhauling an OM 636 engine, it is strongly recommended to follow the workshop procedures and guidelines prescribed by Mercedes-Benz and described in the factory workshop manual. Engines rebuilt to factory specifications using genuine Mercedes-Benz parts will give many years of reliable service. Engines to be reconditioned should be completely disassembled and chemically cleaned, the engine block and cylinder head pressure-tested and oil galleries cleaned. Any damaged studs on the block or head should be renewed. Engine blocks that were not originally fitted with liners should be bored out and honed to the next repair size up to a maximum bore of 77mm. Blocks fitted with liners can be bored to the 1st repair size 75.50mm or the liners replaced. Cylinders must be bored and honed to accommodate new pistons. Crankshafts checked, reground and polished. All crankshaft and camshaft bearings should be systemically replaced. The camshaft and timing gears checked and replaced if necessary. A new oil pump should be fitted before mounting the sump to the crankcase. Cylinder heads must be refaced within given limits and the valve seats reworked to ensure the correct valve height. Ensure that the latest valve guides are fitted. These have an external annular groove to fit a valve stem seal. Early engines do not have a valve stem seal but feature a valve spring retainer with an extended sleeve. Inlet and exhaust valves should be replaced if necessary. When disassembling the cylinder head, the precombustion chambers should be removed and bead blasted for thorough inspection. Removing these pre-chambers can be a tricky procedure without special tools but it is strongly recommended since they are invariably coked up. Attention should be paid to the condition and wear of all valve train components especially on high mileage engines e.g. valve lifters, pushrods, rocker arms, adjustment screws and rocker shafts. Rocker shafts usually show signs of wear and scoring and should be replaced. The lubrication of the rocker shafts is assured by the external oil lines and these should be carefully checked or replaced if in poor condition. Whilst the core engine is being rebuilt, it is advised to have the diesel fuel injection pump and the injectors checked and recalibrated by a competent diesel engineer. New gaskets and seals should be used throughout the rebuild. If facilities are available, rebuilt engines should be run on a dynamometer for several hours to confirm power output, oil pressure and exhaust emissions. The engine can now be completed with its external ancillaries according to its specification and application. Marine engines will require the fitment of a heat exchanger, sea water pump, starter motor, alternator, hoses and pipe work. All these components will need to be checked, reconditioned or replaced. 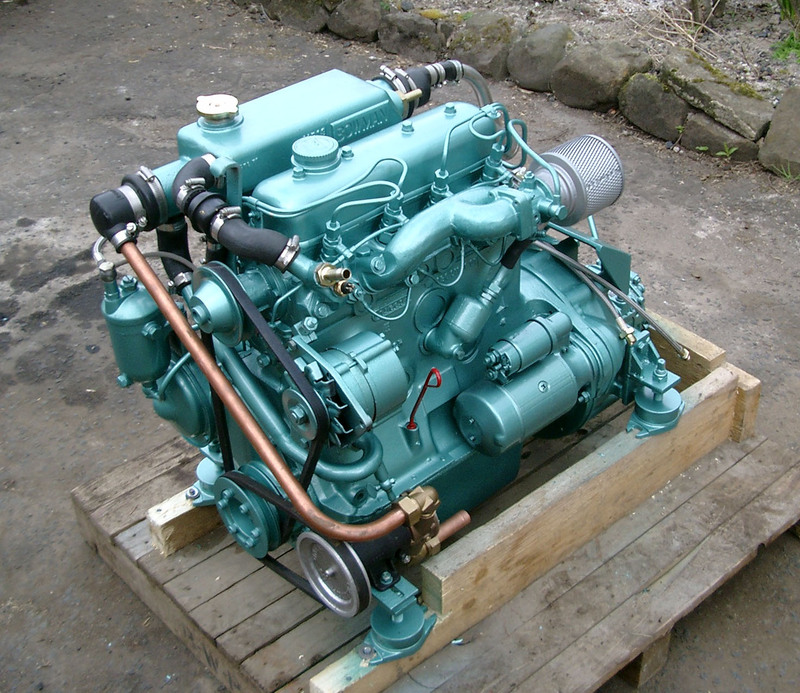 In order to protect the engine from external corrosion, especially important in a marine environment, completed engines should be degreased, etch-primed and painted prior to installation. This will then result in a ready-to-fit marine engine.